legacy, lays a ghost to rest, and meets her destiny! 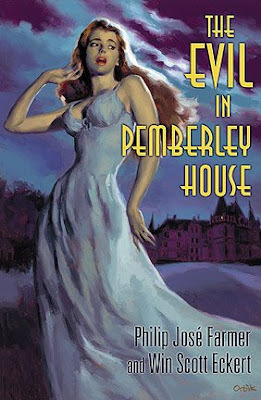 The Wold Newton novel, The Evil in Pemberley House, by Philip José Farmer and Win Scott Eckert, will be published in late September 2009 by Subterranean Press. Dust jacket by Glen Orbik. I note that the book is already unrecommended by one person on Amazon UK, a few months before the release! Hmmm... I don't see that on the Amazon UK page, but... anything you'd like to do to help fight the internet trolls, by marking it recommended yourself, would be highly appreciated. Hmm, bad doins on the internet. I didn't make it up, honest guv. but checking amazon.co.uk today it's not there anymore. It wasn't on the page itself, but on a search page where Pemberley House came up, linking to the page, giving price, details and one recommendation.